In a town with a scarcity of fine dining restaurants, the restaurant offers arguably the best fine dining in Hillsborough. The decor is beautiful and the reason why many diners come to this restaurant. There have been mixed reviews on the food and a turnover in the staff and chef that has limited the potential of this restaurant being a top fine dining spot. CoccoLa has a New York ambiance with a contemporary decor featuring purple, semicircular banquettes, tables without linen, a huge open kitchen, and a raw bar. 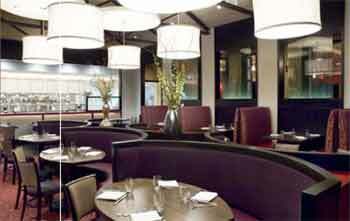 The menu is American with Italian influences, and the dishes are attractively prepared. When available, the popular starters are: Roasted Asparagus and Shrimp with wild mushrooms, diced tomatoes and extra virgin olive oil; and Beef Carpaccio with arugula and shaved romano cheese. When available, the popular dinner entrees are: Pork Osso Bucco, slow braised pork shank with asparagus risotto Milanese; Red Snapper Marechiara - Filet of Florida red snapper sautéed with clams and mussels in a light marinara sauce; and Pappardelle Sausage and Mushrooms with wide fettucine. sweet Italian sausage, and wild mushrooms in marinara sauce. They have a specially prepared wine list that features small, family owned wineries that offer decent quality at a reasonable price.